Poblano is a somewhat mild chili pepper that can be preserved by either canning or freezing. Excellent roasted. 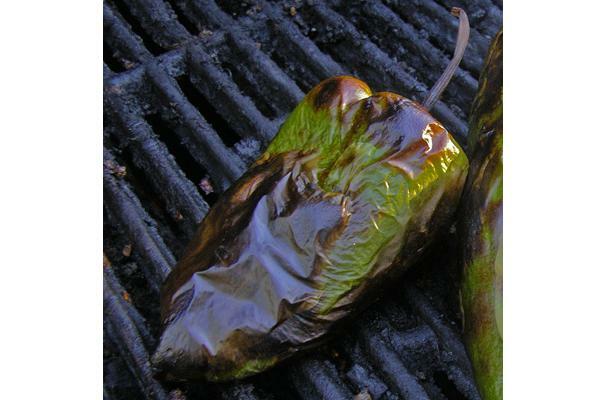 A dried poblano is called ancho. The pod itself is about three to six inches long and about two to three inches wide. An immature poblano is dark purplish green in color but eventually turns a red so dark as to be nearly black. Colors: Poblanos are dark green (almost black) in color. They are about three inches wide and four to five inches long, tapering from top to bottom in a triangular shape. Ripe poblanos are sweeter than green and turn a reddish-brown color. Choosing: The darkest poblanos boast the richest flavor .If left to ripen they turn a reddish brown and become sweeter than the green ones. Buying: They are perfect for individuals who like a little bit of spiciness but not too much heat.Choose fresh chiles with deep colors, avoiding those that look wrinkled or soft. Procuring: One of the most popular peppers grown in Mexico, the plant (of the species Capsicum annuum) is multi-stemmed and can reach 25 inches in height. The darkest poblanos boast the richest flavor .If left to ripen they turn a reddish brown and become sweeter than the green ones. Cleaning: Rinse before using. If Roasting, roast and then peel away the blackened skin. Poblanos may be stored in a paper bag in the refrigerator for one week, or can be frozen (after they are roasted) with skin on for several months. It is particularly popular during the Mexican independence festivities as part of a sophisticated dish called Chiles en Nogada which incorporates green, white and red ingredients corresponding to the colors of the Mexican flag. This may be considered as one of Mexico's most symbolic dishes by its nationals. Poblanos are also popular in the United States and can be found in many grocery stores in the states bordering Mexico and in urban areas.